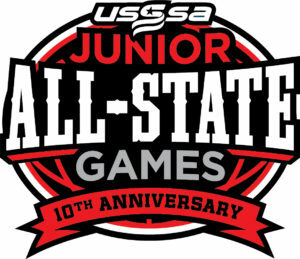 We are celebrating our 10 YEAR ANNIVERSARY of the USSSA Jr All-State Games in 2019. We are proud to announce that this years event will be held in Peoria, IL at the Louisville Slugger Sports Complex. This venue will provide state-of-the-art facilities to all the states competing with 10 outdoor fully synthetic turf fields, including two stadium fields. This event provides an opportunity to players and coaches from different states to form an Elite All-Star team at their age level and represent their state against other All-Star (Elite) teams from around the Midwest. BRAGGING RIGHTS ARE ON THE LINE……. WHICH STATE IS THE BEST OF THE BEST? The cost per player will be $200 and that will include two uniform tops and a fitted hat. The Event will take place August 1st-4th, 2019. this event is for age groups 8u-14u and will be a 5 game guarantee. If you are interested in participating as a player or coaching a team please contact our office at 708.712.0906 or email us at [email protected].